USS New Ironsides (NH 66759). Rear Admiral William Radford, USN. William Radford was born at Fincastle, Botetourt County, Virginia, 1 March 1808, a member of the family that founded Radford, Virginia. Appointed midshipman on his seventeenth birthday, he was promoted lieutenant 3 February 1837. He served in the Pacific during the war with Mexico and commanded the party that cut out the Malek Adel at Mazatlan in 1847. Promoted commander on 14 September 1855, he assumed command of frigate USS Cumberland in 1861. 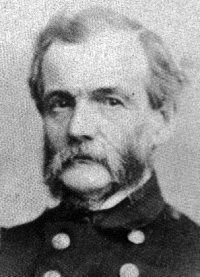 Promoted captain 16 July 1862 and commodore 24 April 1863, he served on court-martial duty at Fort Monroe. As commanding officer of New Ironsides in the North Atlantic Blockading Squadron, Commodore Radford led the ironclad division of Admiral Porter’s squadron—the largest task force of the Civil War—during two attacks on Fort Fisher, defending Wilmington, North Carolina in December 1864 and January 1865. Following the war, on 25 July 1866, Commodore Radford was promoted rear-admiral. He commanded the European Squadron from 1869 until his retirement 1 March 1870. Rear Admiral Radford died in 1890.